Veeam Backup & Replication displays its items in views. 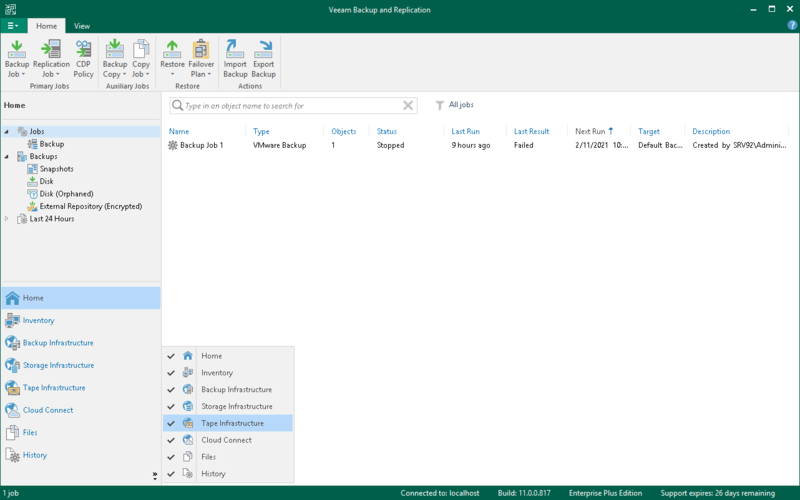 When you click the button of a specific view in the navigation pane, the view content is displayed in the working area of Veeam Backup & Replication. The Home view is intended for work with jobs. It also displays a list of created backups and replicas that can be used for various restore operations, and provides statistics on recently performed jobs. The Inventory view displays the inventory of the virtual infrastructure. The inventory can be presented from different perspectives: Compute, Storage, VM Folders and VM Tags. You can use this view to work with VMs, and VM containers or groups. The Backup Infrastructure view displays a list of backup infrastructure components: servers, hosts, backup proxies, backup repositories and so on. You can use this view for backup infrastructure setup — here you can configure backup infrastructure components that will be used for data protection and disaster recovery tasks. The Tape Infrastructure view displays a hierarchy of tape libraries connected to the tape server. You can use this view to archive data to tapes and restore data from tapes. The Cloud Connect Infrastructure view displays components of the Veeam Cloud Connect infrastructure. This view can be used by SP to manage TLS certificates, configure cloud gateways and create accounts for users who plan to work with cloud resources. The Files view displays a file tree of servers added to the backup infrastructure. You can use this view for file copying operations. The History view displays statistics on operations performed with Veeam Backup & Replication. Right after installation, Veeam Backup & Replication displays only Backup Infrastructure and History views. To display other views, you must add at least one server or virtualization host to the backup infrastructure. Right after installation, Veeam Backup & Replication does not save changes that you make to the navigation pane or views: for example, if you resize panes, display or hide specific views. After you restart the Veeam Backup & Replication console, the main window settings are back to default ones. To save these settings, you must add at least one server or virtualization host to the backup infrastructure. To display the Cloud Connect Infrastructure view, you must install a valid license that supports the Veeam Cloud Connect functionality. You can hide views that you do not plan to use. For example, if you do not use tapes for data archiving, you can hide the Tape Infrastructure view. Click the arrow icon below the buttons in the navigation pane. Click the view in the list.